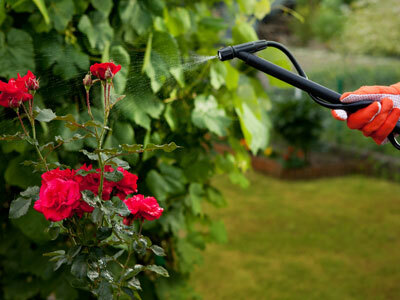 When caring for rose bushes, it is very important to keep proper fertilization in mind to ensure that the plants stay as healthy as possible. Roses which are not fed properly will produce less spectacular flowers and are prone to a wide range of diseases. As such, feeding them with the correct nutrients is of the utmost importance. But with all of the rose fertilizers on the market today, which type is best? A good general rule of thumb is to look for a fertilizer with a well balanced NPK ratio. NPK stands for nitrogen, phosphorous and potassium. These three chemical elements are the primary components in most fertilizers. Different plants require different levels of each element, but roses tend to react best to a roughly even mixture of the three. In addition to this, there will be a decision that must be made with regards to using organic or non-organic fertilizer. Each has its own advantages, so the choice between the two will largely come down to personal preference. Organic fertilizers will feed the rose bush with the nutrients that it requires, as well as improve or maintain the quality of the soil that the bush is rooted in. Non-organic fertilizers will feed the plants, but will do little to help soil quality. On the other hand, many non-organic fertilizers include chemicals that will help to protect roses from both diseases and insects. While these fertilizers are not organic in nature, they still have quite a lot to offer. Adding supplemental organic materials to the soil when using non-organic fertilizers can help to balance out the lack of soil-enriching chemicals. It is also best to rotate the type of fertilizer being used. Because of how chemicals which are added to the soil build-up, continually using the same type of fertilizing chemicals can lead to poor soil quality in the long term. To combat this effect, a scheduled rotation of different chemicals can be very useful. Needless to say, organic fertilizers tend not to require such rotation. It is very important that rose owners who employ this tactic keep track of which fertilizer was last employed, as the rotation will have its best effects when used consistently. It can also be helpful to alternate between organic and non-organic fertilizers, as this will give the rose bush and the soil around it some of the benefits of both types. In addition to standard fertilizers, many bloom enhancing compounds are available, While these are certainly not harmful to rose bushes, they may have some unwanted side effects. Specifically, because many of these compounds are very high in nitrogen, they may cause the growth of excessive foliage on the bush, thus obscuring blooms. It should also be noted that there is also such a thing as too much nitrogen. Having a nitrogen level that is too high can actually harm plants, so use of bloom enhancing compounds with general fertilizers should be avoided if possible. Besides simply fertilizing, there are also some other factors that can be controlled to lead to the best health for a rose bush. Keeping the soil around the rose properly drained is essential, as roses do not tend to react well to extremely wet conditions. Keeping the area that the bush is in clear of heavy shade is also very helpful. Keeping the sun level at 6 hours or more per day is optimal, though some varieties of roses do well with some shade. This may require pruning of any trees that would otherwise block sunlight from reaching the roses. Rose care can be labor intensive, but well worth it for spectacular blooms and healthy bushes. Beginning with a well-balanced fertilizer and proper conditions can get your roses off to a good start. Ultimately, remember to stick to what works and produces the best results as you experiment with different fertilizers.